Insider Tip: Eat some lychees or try some other fresh fruit. It tastes delicious! Hanoi is the capital city of Vietnam. The city has approximately 6.5 million citizens and is the second biggest city of Vietnam. In Hanoi you can experience the Vietnamese street life, be mesmerized by the French architecture buildings, enjoy the fresh food, and – not to mention – the night market. Take a stroll around the old quarter and it may feel like you’ve stepped back in time. – Rain season: starting from January till September. – Dry season: starting from October till December. During June to August it gets really hot and humid, during this time of the year you might sweat a lot! Make sure that you bring a raincoat because there might be a shower now and then. Usually the rain only last for a few minutes but that depends on the weather conditions. After the rain it can be sunny or a bit cloudy. From the middle of September to the end of November might be the best time to visit Hanoi. The temperature is around 25 degrees Celsius and there is a dry atmosphere. Beginning December the temperature will start to decrease, the weather will feel colder. If you decide to visit Hanoi during this time of the year, then you should bring some warm clothes. Personally, I think Hanoi is a great city to visit all year round! Hanoi Airport is called Noi Bai International Airport and is the biggest airport in the northern part of Vietnam. Originally this airport was built for the Vietnamese Air Force. However, in 1975 Noi Ba International Airport opened. The airport is located 45 kilometers from Hanoi city center and can be reached by taxi, public buses or minibus. Taxi: the taxi stand is located at the terminal exit. Compared with the bus and minibus the taxi is a bit more expensive. However, if you arrive after midnight then the taxi is your only option to reach Hanoi city. Bus: the local bus departures every 15-20 minutes to the city center and takes approximately one hour. The bus stop is located on the right side of the terminal exit. Minibus: the airport minibus offers transportation directly to your accommodation in Hanoi. A one way trip from the airport to Hanoi city centre costs approximately cost 32,000 Vietnamese Dong (VND). Old Quarter – This is the area where you’ll be surrounded with buildings in the French architecture style. It is in the old part of Hanoi where you can wander around the street and be mesmerized by the street life and the buildings. In the early mornings you will see all the locals gathering together and having breakfast outside on small chairs. Take a stroll in the old quarter and discover the variety of stores and the fresh fruit. 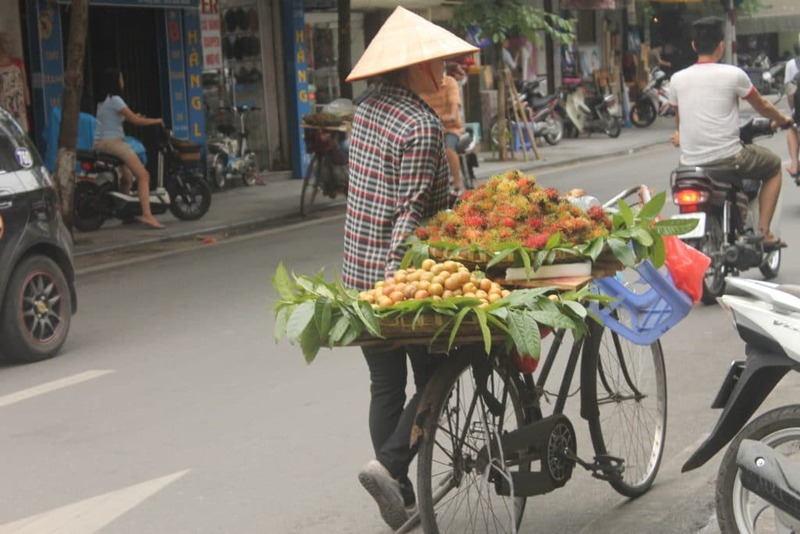 While wandering the streets of the Old Quarter you’ll probably spot locals wearing the typical Vietnamese bamboo hats walking with their bicycle full of fresh fruit. Night market –The Hanoi night market is held on three days in the week – Friday until Sunday. Opening hours are from 6pm till 11pm. On Saturday night there are even music performances. The night market is located in the Old Quarter from Hang Giay to Hang Dao. You can reach the night market by taxi or bus. Be aware that there is a lot of traffic due to the closed road for the night market. If you are staying in the Old Quarter then the best way to reach the night market is by foot. Tip: While taking a stroll at the night market you should watch out for pickpockets. 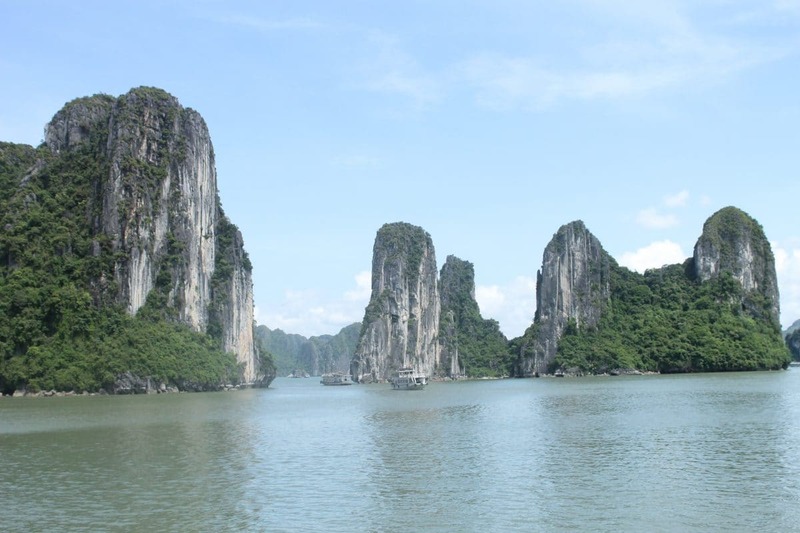 Halong Bay – Is one of the must see places while you are in Hanoi. If you want to visit Halong Bay from Hanoi, then you can book a tour. The tour picks you up from your accommodation and drives you to the harbor of Ha Long Bay. The moment that you arrive in the harbor you will see a lot of boats. Each and every boat has its own style and shape. 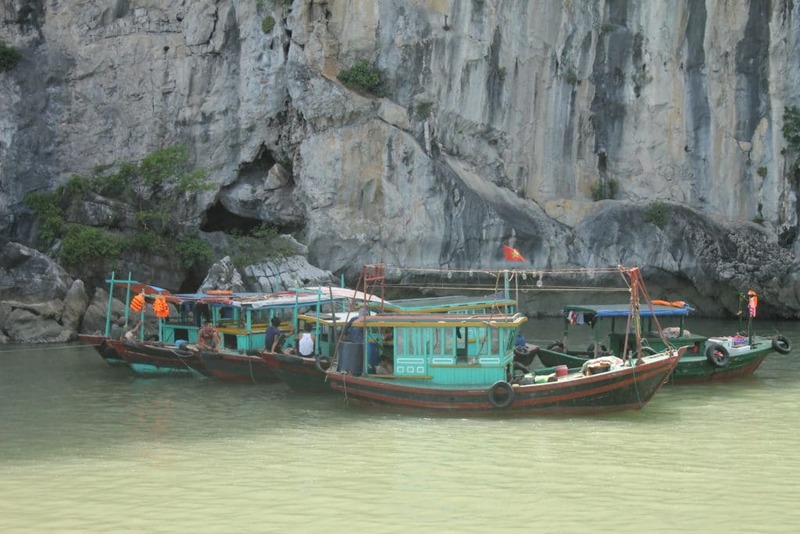 If you are going to Halong Bay by tour then the tour guide will take you to the boat. Coming from a western country myself I was surprised when the captain told us that we shouldn’t panic or be afraid when we bump into another boat. The captain said that there are over 400 hundred boats in Halong Bay and therefore it is hard not to bump into another boat. For safety reasons we had to stay on the lower deck. After leaving the harbor you are able to walk around on the boat and go on the upper deck to watch the view. There are thousands of limestone karsts and isles. Each limestone karsts has its own unique shape and size. Several islands are hollow which allow you to enter the enormous caves by kayak. It’s a real recommendation to see nature’s beautiful scenery. While floating on the boat you will see floating fishermen villages, living on their boats. Hoan Kiem Lake – This is the perfect place to walk around the lake and to visit the temple which is located in the middle of the lake. If you would like to visit the temple then you can purchase your ticket at the booth on the left side before crossing the bridge. Opening hours are between 8am and 5pm. The lake is surrounded by trees which makes it nice to relax in the shadow for a bit. The best place to discover the local food is at the night market. At the night market there is a lot of variety to eat. If you don’t know what to choose then the best option is to go to the shop which is the busiest. This store must be really good for people to wait in line. Red Bean Restaurant (94 Ma May St, Hoan Kiem Dist, Hanoi, Vietnam) – This restaurant servers authentic Vietnamese cuisine dishes. The dishes are produced as innovative ideas and are presented beautifully. The restaurant is located in the Old Quarter and has a romantic atmosphere. The building is inspired by the French architecture style and the food tastes really good! Hanoi Social Club ( 6 Hoi Vu, Hoan Kien Dist, Hanoi, Vietnam) – This place is a the perfect place if you like the bohemian style. There is a rooftop bar which is a perfect spot to have a drink. There is a relaxed/chilled out atmosphere with comfortable seats and sofas. The people are really friendly and it is a good place to meet other people. Hanoi Social Club is located in the Old Quarter near St. Joseph’s Cathedral. As mentioned in the must see section, the old quarter is the most popular area to stay. You’ll find most hotels and guesthouses in this area. Accommodation prices are a bit more expensive compared with other place in Vietnam. If you are travelling on budget then Little Hanoi hostel 2 is a good place to stay. Located at the heart of Hanoi’s old quarter where you’ll have everything within walking distance. Hoan Kiem Lake is positioned across the street from Little Hanoi hostel 2 (11 Bat Dan, Hoan Kiem Dist, Hanoi, Vietnam). Another recommendation to stay is The Golden Sun Palace (33 Hang Quat, Hoan Kiem Dist, Hanoi, Vietnam) which is located in the same area as Little Hanoi hostel 2. This hotel combines the modern architecture and as well the traditional Vietnamese architecture style. A beautiful building and the staff are very helpful. Here are additional options for where to stay in Hanoi. For more travel tips and suggestions for Hanoi, have a look at these local blogs and resources. Or leave a message and I might be able to help you answering your questions. Vietnam Tourism Office – Get information about Hanoi, places to visit, accommodation, and much more. Hanoi Travel Blog – Tips from locals with recommendations of places you must see and things you must do.